The festival organisers today released the 2009 Fine Guide map, showing the main changes to the site for 2009. As previously reported exclusively here, the Queens Head moves from it's previous spot near The Other Stage, to William's Green - a new entertainment area named in memory of Michael Eavis' grandfather. 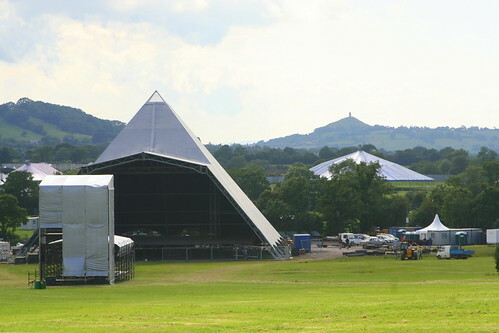 The cinema field and two acres of Woodsies - previously public camping - are being given over to hospitality and crew camping, freeing up space in the 'interstage area' between the Pyramid and Other stages. The indoor cinema moves into Norman's Close, to share the field with the Acoustic stage which remains in its familiar position. The outdoor cinema, a feature of the festival since 1989 where it had it's first home at the bottom of Kidney Mead, will not be present at the festival. Oxfam Crew camping, which last year moved from Tom's Field to Big Lickle, this year moves again, one field north into Spring Field, following a rumoured breakdown in relations with the owner of Big Lickle. Other changes, following a successful application to Mendip council, include - for the first time - three campervan fields in the west, labelled as a family area. The festival have not yet announced how passes will be allocated for the seperate east and west campervan areas. Additional parking fields have been added in the west, balancing against the parking fields now being given over to campervans. Family camping for tents, which grew in 2008 with a newly allocated area in Spring Ground, gains a third area in 2009 in the corner of Paines Ground adjacent to Gate D.
Also in the west, where the festival has been expanding since 2005, the fenceline will grow to add a 22 acre crew camping adjacent to the Steanbow Farm Dairy Unit, bringing the total area inside the Super Fortress fence up to 750 acres - which excludes campervan fields and car parks. Expect more detailed news on site changes here at GlastoEarth in the run up to the festival. Follow glastoearth on Twitter for updates as they happen.